Select a full panel package or individual testing option. With over 4,000 laboratories, nationwide, getting tested has never been so convenient! Visit your lab of choice the same day you order your test. No appointment necessary! Get in and out within 10 – 15 minutes! View your results in 2 days or less in the STDAware secure patient portal. No embarrassing wait. Discreet billing. All information is private and secure on your patient portal. STDAware uses state of the art technology and methodology to ensure reliable and accurate results. Get into a testing lab the same day you place your order. No appointments necessary. Testing takes 10-15 minutes. Most test results returned within 1-2 days after testing is completed. The knowledgeable and compassionate advice staff at STDAware is here to help you through every step of the testing process. STDAware’s in-house medical staff provides post-test consultation for anyone who tests positive for an STD, at no additional cost to you. STDAware uses state of the art data encryption tools to ensure that your information is protected, private, and secure. STDAware is committed to providing excellence in both our testing products and our customer service. From start to finish, STDAware is here for you. The STDAware 10 Test Panel + HIV RNA early detection bundle is recommended by doctors for those who want faster yet reliable HIV testing results and can be taken if suspected exposure occurred within the last 9-21 days. RNA early detection testing is also recommended for anyone who is interested in starting PrEP. The STDAware 10 Test Panel is doctor recommended and provides a comprehensive STD screening which screens for all of the most common STD conditions: HIV-1 and HIV-2 (using the 4th generation antibody testing methodology), herpes 1, herpes 2, gonorrhea, chlamydia, syphilis, hepatitis A, hepatitis B, and hepatitis C. Many STDs are asymptomatic. The only way to know if you have an STD is to get tested. The STDAware Dual Test Bundle screens for the two most commonly reported STD infections in America. It is very common for people to be infected with both chlamydia and gonorrhea, at the same time. Left untreated, both infections can cause serious health complications and risks. Anyone who tests positive for chlamydia or gonorrhea will be provided treatment at no additional cost. ...cheaper than a doctor's office visit and everything was included. 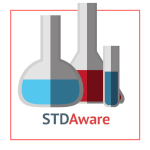 If you're looking to get tested, STDAware.com is the way to go. To get started, either place an order on the STDAware website by clicking here or call our toll free customer service line at 1-855-588-6958. The knowledgeable and compassionate advice staff at STDAware will be happy to assist you with any questions, selecting your testing solution, choosing a location, and checking out. Once your order has been placed, you will receive a confirmation email with a .pdf attachment. This .pdf attachment is your lab order, which you will print and take with you to your testing location of choice. If you have any difficulty printing your lab orders, please call the STDAware customer service team to have your lab orders faxed directly to the lab you wish to visit. You do not need to make an appointment and can go the same day you place your order, or anytime that is most convenient for you. Testing is quick and simple. Testing involves either a blood or urine sample. Most patients are in and out of the lab within 10-15 minutes. Absolutely. STDAware takes every precaution to ensure that your test results and personal date are safeguarded with some of the best security measures in the industry. All STDAware patients can have confidence knowing that their information will never be shared. To learn more about our privacy standards, click here. STDAware understands how sensitive this type of purchase can be. That’s why we ensure that billing for any STD test through STDAware is discreet. The line item purchase that will appear on a bank or credit card statement will come from First American Service Group. No additional description or ID will be included. Nothing will say “STD.” To learn more about the measures we take to keep all of our client patient information private, click here. 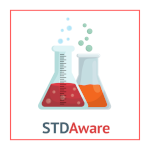 STDAware is the ONLY online STD testing service provider that offers post-test consultations with a medical professional, free of charge. If an STDAware patient tests positive for having an STD (with the exception of HSV-1), a doctor will attempt to reach out in order to review the test results and treatment options or the patient can call the STDAware customer support team and schedule their post-test consultation. Any STDAware patient who tests positive for having chlamydia, gonorrhea, or HSV-2 will receive treatment at no additional cost. To learn more about the no-cost services offered by STDAware, click here. STDAware has been committed to providing the best, direct to consumer, healthcare laboratory testing solutions since 2013. Our mission is to increase awareness and education about sexual health and STDs. No one should be in the dark about their sexual health. 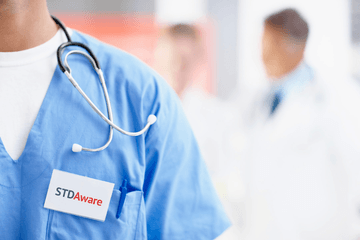 By de-stigmatizing and increasing STD testing, STDAware believes it can reduce the spread of disease and increase overall health and prosperity. STDAware stands by its patient clientele and ensures that everyone gets the medical care and attention they need and deserve. With over 4,000 testing locations, nationwide, we make getting tested accessible, affordable, and simple!